The first bye week of the year brought us some much needed rest for a few of our injury-ridden fantasy players. While there were six teams on bye, I’m pretty sure a few extra teams got confused and thought they were also on their bye this week, judging by the pathetic performances on the field (lookin at you Eagles’ offense). I was also on bye this week, so we’re going to get straight into the injuries. Expect a report on an injury bothering many players right now, the pulled hamstring, next week. We’ll still give out a Darwin award though – this week it goes to Giants TE Larry Donnell. Why? Lack of self-confidence. 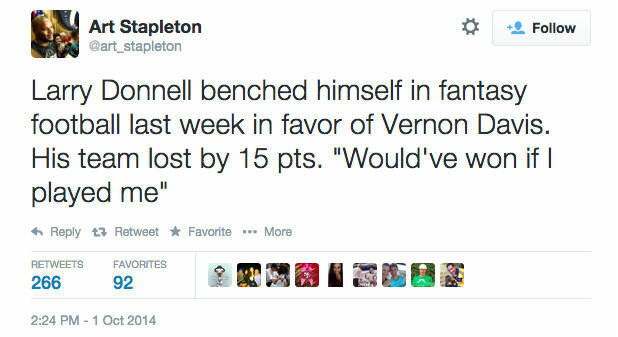 Donnell’s not going to get anywhere if he doesn’t believe in himself enough to start him on his own fantasy team. Come on, Larry. Shoulder Nerve: Rather than making progress, Palmer appears to be going backwards. The nerve in his shoulder has a contusion, and it doesn’t seem to be getting better. He’ll be on the bench again for week 5. Left ankle injury: After a great start for the Vikings in week 4, Bridgewater rolled his ankle late in the game. With the short week, the Vikings decided to sit him on Thursday night’s blowout against the Packers. Looks like they could have used him. He should be back for week 6. Ankle: After hearing his ankle “pop” in last weeks game, Johnson has been held out of practice most of this week. He told reporters he is “fine”, so expect him to start Sunday, but he may not be his usual self out there. Ankle: After playing as a decoy last week, much to the dismay of fantasy owners, Megatron has not made much progress this week. Rest would probably be best for him, but it looks like he is expected to start after sitting out of practice this week. Hamstring: Decker’s hamstring is still bothering him and he was seen leaving practice early this week because it was tight. He had a productive game last week none-the-less, but will again be a game time decision this Sunday. He’s really the only passing weapon the Jets have so expect him to at least try to play. Illness: Looks like Floyd got sick this week and missed practice, but he’ll be good to go against the Jets Sunday. Expect a lot out of the Chargers this weekend, although it may not go Floyd’s way with competition from Keenan Allen and Eddie Royal. Dislocated Elbow: Moreno was originally hoping to be back for week 6, although he was quoted as saying it could be looking more like week 8. Then it was reported he may have been joking, so, who knows. Hamstring Injury: This injury will probably bother Foster all season. He is listed as questionable for Sunday, and probably the Sunday after that, and…you get it. Consussion: Bell hasn’t cleared the concussion protocol yet, which is a bit concerning as we approach Sunday. I wouldn’t expect much out of him this week if he does pass the protocol and play. Looks like Reggie Bush will get the bulk of the work instead. Knee: It looks like Stewart is out for week 5. They’ll be a committee of running backs to replace him (I’m getting pretty tired of this committee thing), but none of them are worth starting on your fantasy team. Knee: After an expected return this weekend, Tate seems to not be so confident. He’ll be testing it on Saturday, and will probably be a game time decision. Concussion: Paul was concussed after a nasty hit against the Giants last Thursday, and has been limited in practice this week. I think he will start, as he is healthier than Jordan Reed at the moment, but he could very well end up on the bench this week next to Reed. Back: Davis ahs been having back spasms all week, and it doesn’t look like he’ll play Sunday as he has not participated in practice at all. October 3, 2014 in Fantasy Football, Football, NFL.